Jablonec nad Nisou is the administrative, cultural and recreational centre of the Jizera Mountains. It lies in the north-east of Bohemia in the valley of Lužická Nisa and its tributaries. Although the first written record regarding Jablonec dates back to 1356, a permanent settlement came about in the 16th century, when the first glassworks and a church were built in Mšeno. A major change occurred in the second half of the 17th century. Thanks to its favourable location, glass production started developing rapidly as did trade. In the middle of the 18th century, the first trinkets appeared and brought the town both wealth and fame. In 1866, Jablonec was raised to the status of a town by a decree from emperor Franz Joseph I. Notable buildings and even entitě quarters are living proof of the wealth that flowed into Jablonec in the years prior to World War I. Two prominent buildings were constructed, the Church Of The Sacred Heart Of Jesus on the Upper Square and the town hall on today’s Mírové Square. The most successful sport club in the town is the FK Baumit Jablonec football club, which in the 2009-2010 season placed 2nd in the Czech first division. 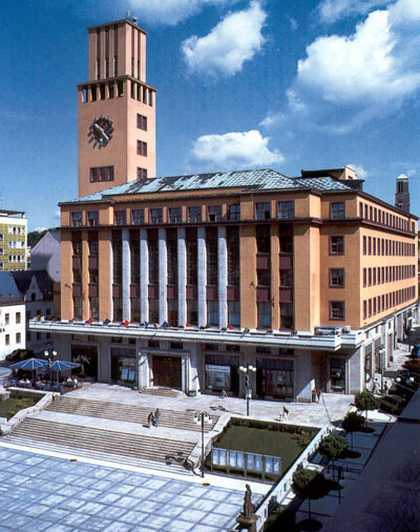 Notable figures born in Jablonec include the architect Josef Zasche, author of the old-catholic Holy Cross Church and the Roman Catholic Church Of The Sacred Heart Of Jesus, as well as the writer and poet Gustav Leutelt and the conductor Peter Hermann Adler.